Off the highway and down a desolate dirt road in the posh hamlet of Montauk is where you’ll find new restaurant, Navy Beach. A massive make-over reveals a smart-chic beachy restaurant with 200 ft of sand and serene views at its door step. A large bar anchors the dining room with white-washed panelling and exposed brick walls. The decor consists of nautical memorabilia, glossy photographs of swimsuit models, and wall mounted boxes housing vintage 1950′s style bathing suits and caps. Chef Paul La Bue is at the helm navigating a seasonal coastal favorite menu with an emphasis on local seafood. I was cordially invited by new owners Franklin Ferguson, Frank Davis and his wife Kristina, to the friends and family launch, which was filled with locals feeling excited and relieved that Navy Beach had graced their community. Apparently, the predecessor Sunset Saloon, hadn’t been anything special for the last couple of years. My catch was The Navy Burger, an 8oz. 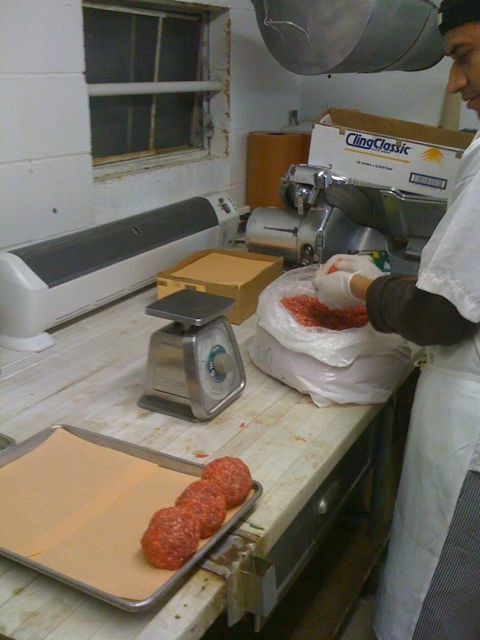 meaty monstrosity constructed with a special hand ground beef blend from Cromer’s Market in Sag Harbor. The chef’s secret is a smokey sweet bacon marmalade which was generously slathered over the top of the patty. I was escorted to my beach-side perch along the far wall passing plenty of vino soaked patrons as they took advantage of the laid back vacay life style. The fire lights that were buried in the sand outside my window beautifully flickered as I struggled to see the menu. A happy haze came over me as I gained my thoughts and realized, ” I’m on the beach in Montauk, New York……not St. Barths or Anguilla! ” The server took my order as I settled in with a trio of blue points and a cold beverage to satisfy my sea-air propelled hunger. The oysters were meaty and smooth, with a hint of sweet-a perfect burger prelude. 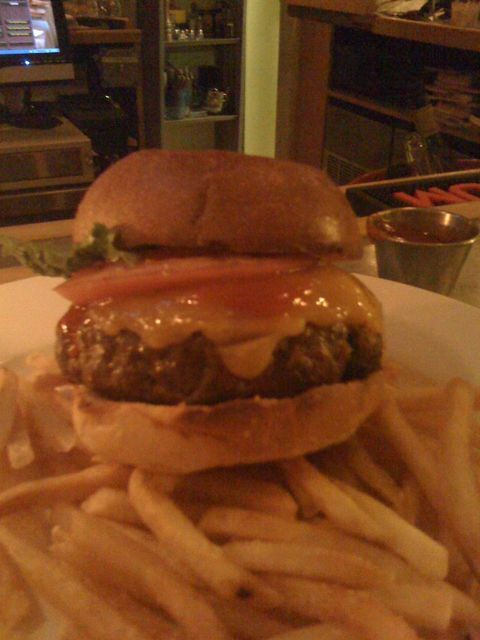 The burger arrived glistening with fatty goodness as loads of thick gooey bacon marmalade cascaded on to the plate. The first bite was a party of flavor in my mouth, from the smokey sweetness of the marmalade, to the velvety creaminess of the cheese. The bun was a faux-Spotted Pig style grillade version, light and toasty and melt in your mouth. As I wiped the last thumb full of marmalade off my plate,I answered the waiter’s question “How was everything?? ” …without saying a word! In addition to the burger the menu also features, Halibut Ceviche;Asian Chicken Salad with honey-miso dressing,Lobster Pot Pie and Pan-Roasted Filet with Lobster Tempura. The host and staff of Navy Beach made this moment memorable and definitely one I want to repeat. 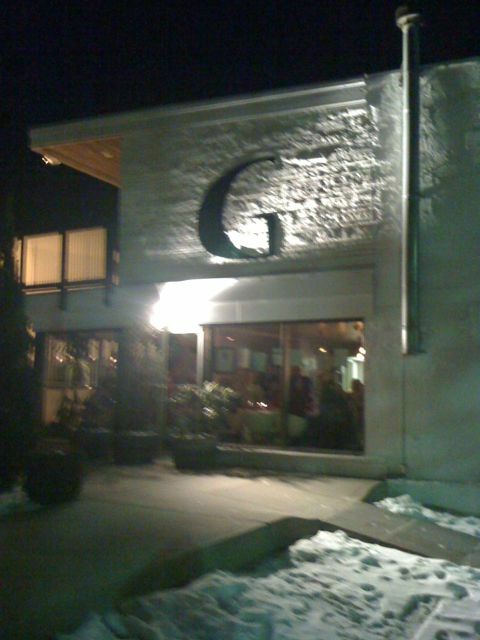 On my recent trip to Greenport, I stayed at the sophisticated and conveniently located Greenporter Hotel, which is owned by extremely friendly Deborah Pittorino and her husband Bill. 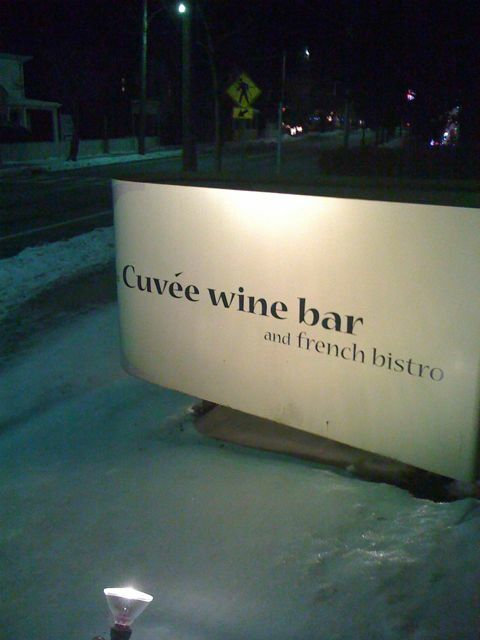 In addition to this hotel is an amazing Restaurant situated steps away called La Cuvee Bistro and Wine Bar. La Cuvee Bistro is the creation of talented chef/investment banker Deborah Pittorino, who found her culinary way after years of travel and cultural experience with her family as a young adult. As my trip was drawing to a close, I had one more very important task to accomplish and that was to tackle the burger creation of La Cuvee. After dining there on exquisite meals such as Standing Rib Roast with glazed carrots and Yorkshire pudding and Roasted Duck with pureed turnips, I was pretty confident that her burger would be a sure fire hit. I was invited by Deborah by written invitation to sample her burger, which I delightfully accepted and attended on one of the La Cuvee restaurant many busy nights. 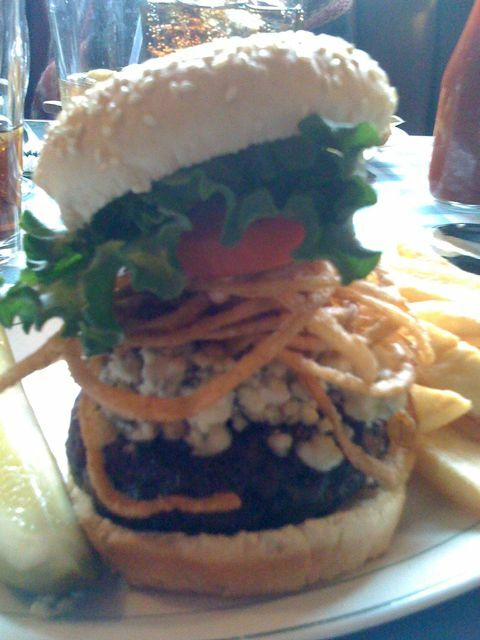 The burger was served up open faced and resting on a swarm of crispy shoestring fries. 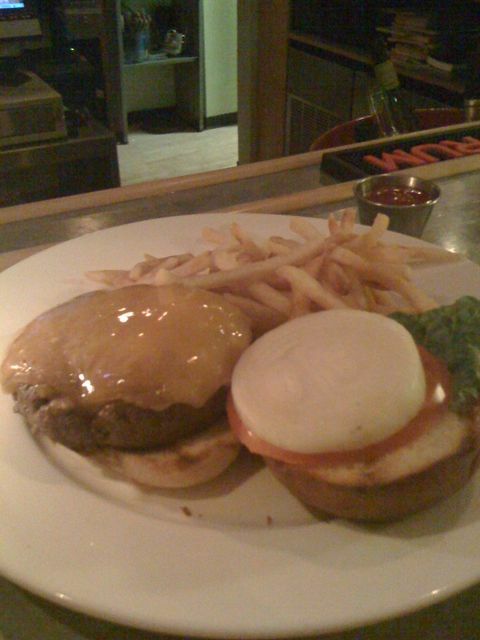 It was dressed with a sizable hunk of melted cheddar cheese; fresh lettuce and onion all neatly snug on top of a brioche bun. The taste was delightful and immediate as the juice of the meat dripped down my chin and I grinned with satisfaction after every chomp that I took of this beefy, but delicate pleasure. The French fries were very good, possibly some of the best I have had in a long time. I sat at the modern, yet comfortable, bar and chatted with Deborah as I worked on her burger creation and occasionally gazed out the bayside windows behind me and watched the frigid cold surround the small seaside town. I enjoyed my stay, my burger and most of all meeting the people that created and ran this small boutique style hotel, I can’t imagine a better place to hang my hat or satisfy my hunger than the Greenporter, Hotel and La Cuvee Bistro. I found myself in Greenport this weekend, a quaint little seasonal fishing village located on the North Fork of Long Island. 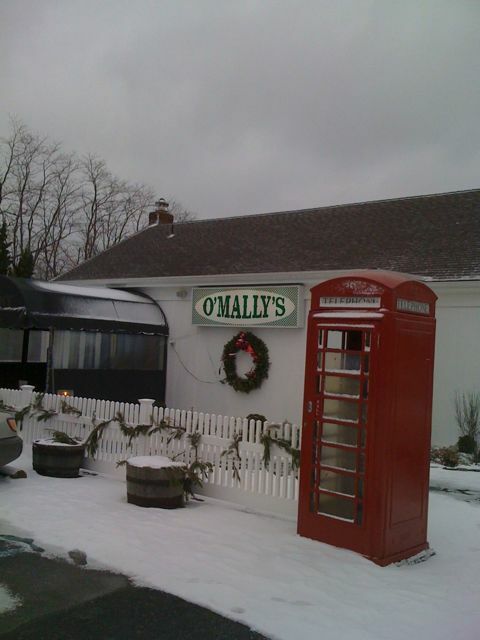 After consulting with some burger loving locals, they all directed me to O’ Mally’s. Situated about 10 minutes drive from my hotel, I got behind the wheel of my KIA rental and trudged my tiny car through the snow, which had fallen the evening before. I arrived to a cozy roadside tavern with Irish and European accents complete with classic Tiffany style lamps and large stuffed Moose heads mounted on the walls. I was seated in the back and given a menu that consisted of 33 artful variations of the classic roadside burger particularly the Alien Burger, Saloon Burger, Marinated Florentine Burger and the Supa Duper Burger which was a 1 pound of meat with every topping available in the kitchen for $75.00. The owner Phil Mannino has been in the restaurant business for over 45 years, and was reminiscing the story of how he created this colossal burger menu over martinis one night long ago. He proceeded to share with me the process of his brilliant creations was like many other burger connoisseurs, which was a good local butcher that supplied a careful combination of beef that was catered to his liking. I was given a rare tour of a behind the scenes look at the painstaking process that goes into this meaty morsel. I made my way back to the table past happy patient patrons who smiled and looked on with jealously that I was getting the special treatment. 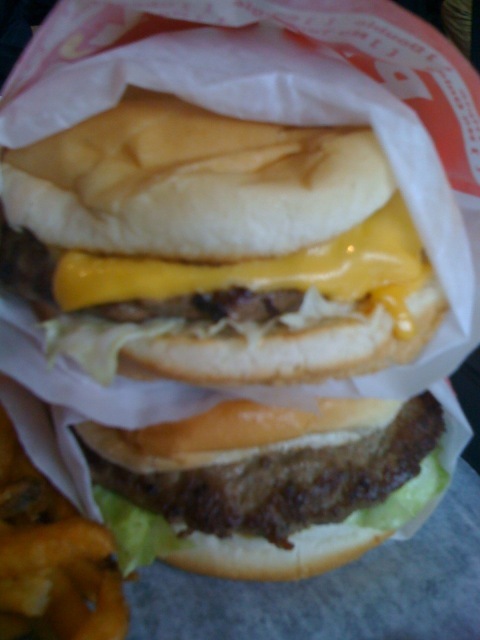 After pondering over several selections I had decided on the Burger Papa, a towering 7 oz. burger with creamy Gorgonzola cheese, frizzled fried onion rings, lettuce, red onion and juicy tomato. It was suggested by my confident and knowledgeable waitress that “some Saloon Sauce would go perfect with that” I obliged her suggestion and settled in for the wait which was sure to be worth it. The Burger Papa arrived and I could see why it was named this, it was the Papa of all burgers with a giant stack of frizzled fried onion rings and Gorgonzola cheese slathered over a juicy generous patty. My first bite was moist and absolutely lovely tasting the strong powerful flavor of the cheese and the crispy delightfulness of the fried onion rings. The quality of the meat was superb and the dressing of the Burger Papa was nothing short of spectacular. I also had an opportunity to try the O’Mally’s mini’s, gourmet version of White Castle burgers which featured tiny little chopped onions and delectable dill pickles that exploded with flavor in your mouth after every bite. 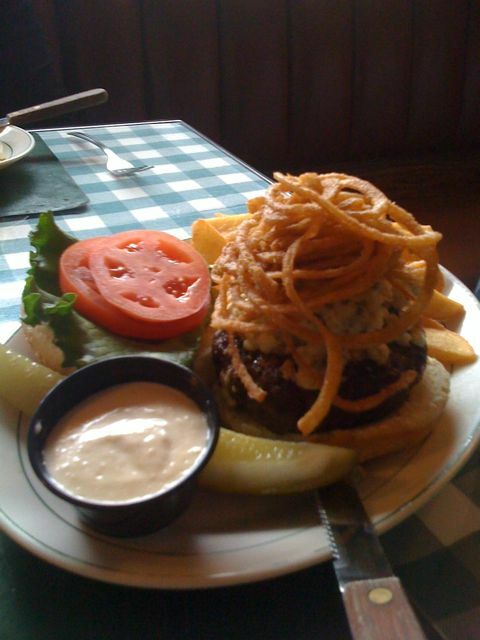 All the burgers at O’Mally’s are served open faced and with lettuce, tomato, dill pickles and a generous bed of steak fries or shoestring fries. I really enjoyed meeting Phil and the people at O’Mallys and was honored and privileged to be able to witness such gentleman and genius of the burger world.